Ever the series to ensure plot details remain shrouded in a thick veil of secrecy – remember the furore over The Reichenbach Fall? – series co-showrunner Mark Gatiss has unveiled the first image from the set of Sherlock season 4, teasing the return of Benedict Cumberbatch’s famed sleuth and, potentially, 221b Baker Street. And we do mean a teaser. Taking to Twitter, Gatiss, who recurs in BBC’s award-winning detective drama Sherlock’s older brother Mycroft, posted the off-screen image – one that appears to be taken from a monitor on set. Even if it raises more questions than answers, make no bones about it, Cumberbatch’s mastermind is back in business. 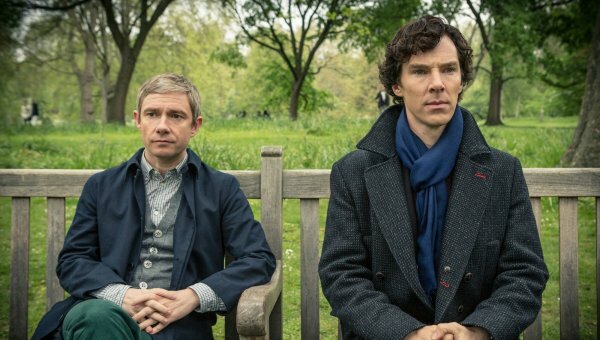 But could we be nearing the series finale of Sherlock? Joining Gatiss behind the scenes for season 4 is fellow showrunner Steven Moffat, who recently spoke about how the story of Sherlock and Holmes is “about to reach its climax.” Whether that directly tees up an imminent conclusion, though, remains to be seen. Moving from solving cases to getting to grips with parenthood, season 4 picks up at a time when Watson and Mary (Amanda Abbington) have welcomed their first child. Sherlock season 4 is expected to make its bow towards the end of 2016, when fans will be taken on another three-episode journey of “laughter, tears, shocks, surprises and extraordinary cases.” Rachel Talalay (Doctor Who, The Flash) will take the reins of the premiere.